If you sign it to your Google account from a different country, you'll probably see a page that asks you to verify it's really you and not someone who managed to obtain your password. This page has been recently redesigned and looks better. 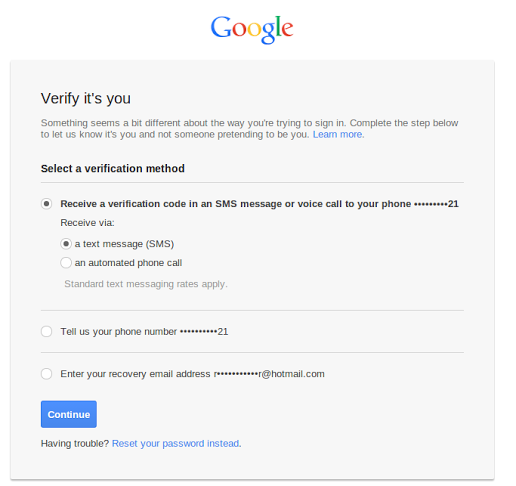 After you enter your credentials, Google shows a list of verification methods. If you've provided a recovery email address, you can enter it (Google shows the the first and the last character). If you've provided a phone number, you can enter it or ask Google to send a verification code in an SMS message or voice call. You can answer your secret question or enter the name of the city or town where you usually sign in. If you can't answer any of the questions or enter the verification code, you still have an option: reset your password. "The additional step at sign in is designed to prevent an unauthorized person who does not know you from accessing your account, even if they've obtained your username and password. While this won't necessarily stop people who know you from accessing your account (for that, try 2-step verification), it's an important measure to keep hijackers who have a long list of passwords from doing malicious things with your account, such as creating spam or accessing and deleting valuable data," informs Google. This page has a screenshot that shows the old interface. Google used to ask: "Hey username@gmail.com, is that really you?". Google also has a page that shows a list of recent security-related actions you've taken, like signing in to your Google Account or changing your password. Google includes the IP address, approximate location, as well as the browser and operating system, so you can quickly spot unusual activity.